It has been a beautiful, traditional English summer, at least as far as weather and wildlife are concerned. I don’t suppose we’ll remember 2010 as one of the great summers, as it hasn’t been really hot, but around here it has certainly been one of the driest and sunniest I can remember. After the cold spring and late start, wildlife finally caught up! Before I get on to this month’s wildlife walk, I want to look back over that lovely summer. I also want to thank the growing number of new friends who stop me as I walk past (especially outside the Crown!) to ask me about flowers they have seen. I have had some challenging identification tasks. Through June I made several visits to Eades meadows, as I know some readers did. It was especially good this summer. It’s so thick with flowers there is hardly any grass left. As well as the green-winged and common spotted orchids, this year I found fragrant orchids – they are more delicately shaped, pink and with a lovely scent. Among the later flowers I noticed a lot of saw-wort, a bit like a slender knapweed; pepper-saxifrage, an unusual yellow flower a bit like cow-parsley; and a patch of yellow creeping jenny. The butterflies and other insects were profuse this year. I took my brother, an ex-farmer, and he said he knew now where he was going wrong trying to create a wild-flower meadow in his garden: he hadn’t got a few centuries spare to establish it! If you go now, you should see meadow saffron. While on a visit to north Yorkshire I saw their meadows too. In some were the beautiful pink birds-eye primrose, big yellow globe-flowers, and starfish-shaped butterwort. In the mountain pastures of upper Teesdale I saw grass carpeted with vivid blue gentians, multicoloured mountain pansies, and the white mountain everlasting, a bit like edelweiss. All of these places are carefully managed nature reserves now, but show the wonderful diversity of native plants we used to have. I had exciting finds around here, too. Just a few hundred yards from my house I found a huge patch of ragged-robin, an old meadow plant, growing in a wet field. It was accompanied by a delightful little plant called brooklime, with a tiny blue flower. This has the Latin name veronica beccabunga, which I love because it sounds like the heroine of a computer game. I took a couple of groups on wildlife walks from Withybed Green during the summer, and they are always surprised by the variety of the plants. The many-petalled creeping buttercups, marking old pasture, were very popular, with normally staid people getting excited about finding a ten-petaller! You may remember I have written before about the poppies that grow at Blackstone near Bewdley. They were abundant in 2007, thinner in 2008, and disappeared almost completely last year. However, the Worcestershire Wildlife Trust took over some fields there last year. This year there was a huge field full of poppies and other arable weeds like wild radish and rocket. The Trust hadn’t planted anything, just created the right conditions. They intend to grow cereal crops in the fields, but will leave big margins for these plants to flourish. This site, near the Blackstone car park, is also the home of a rare insect. This is the black bee, which looks like its name. 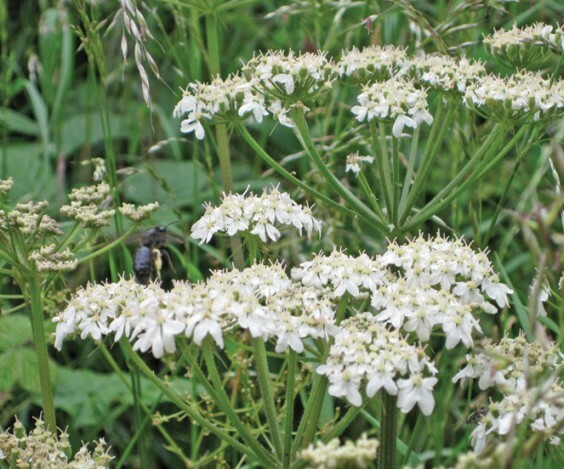 I was lucky enough to see one, on a head of hogweed flower (pictured above), and was helped to identify it by a passing insect-lover! Throughout June I looked for the bee-orchids at the spot along the canal where I have seen them for the last three years. The vegetation had been mowed rather too early so lots of long grass, nettles and thistles filled the patch. Finally at the end of June one bee orchid appeared, very small and delicate, on a shorter patch of grass. I was delighted, as were friends of mine who visited the spot. Unfortunately, a few days later the patch was mown again, much too early this time, and they had gone. I found that British Waterways had changed contractors. I hope the orchids have survived underground. It shows how delicate the balance is between success and failure of some plants, depending on our activities. I was pleased to visit the Meadows in Alvechurch this summer, and see that they have been well-managed to the extent that they now live up to their name, rather than just being a park. The unmown patches had lovely meadowsweet, sorrel and buttercups, and later some knapweed, as well as a good variety of grasses. My regular canal walks have shown plenty of young water birds, though with a low survival rate. The family of swans with seven cygnets has reduced to two young. Earlier I saw the swan carrying young on its back, and oddly enough saw a merganser duck doing the same on the Tees. There are plenty of ducklings – many born late in the summer – and a family of geese and goslings. I finally saw a young moorhen after the earlier losses, and hope it survives. Flowers by water have done well in this dry summer. Even the canalside stretch near the former scrapyard where all the trees were cut down had a lovely bank of flowers: camomile, feverfew, purple loosestrife among them. The best moment along the canal was when I saw two kingfishers together on the “dead arm.” One of them was still there the next day, so I hope they may have been nesting there. I was able to watch them flash along the canal for quite a while, but they evaded my camera! The flowers in the canal have been particularly good this year. The dead arm is almost covered over with yellow water lilies, so thickly that the moorhen can skitter across it. There were also water-plantains and arrow-heads growing in the water. While walking round the Alvechurch Open Gardens I found myself looking at the wildlife instead of the planted things. It’s interesting how many gardeners now have allowed wild flowers to colonise parts of their gardens, together with old garden plants which are nearly naturalised, and very attractively too. I saw some of the flowers of a completely different landscape in Scotland later in summer. The wild peninsula of Coigach in the north west Highlands looks quite barren at first glance, but on closer inspection is full of little flowers. Orchids are everywhere, along with thyme, thrift, eyebright, three kinds of heather, butterwort, sundew, bedstraw, bog myrtle – among others! The sea birds included fulmars and guillemots, and we saw seals galore. We think we saw a golden eagle over the mountain where they live, but as always it was too far away and could have just been a buzzard. On the way we saw a lot of red kites, one of the great success stories of re-introduction. It looks like being a good year for fruit. I ate good wild strawberries, and cherries from native wild trees. Now, as I write in August, the countryside is already beginning to look autumnal, and I have eaten my first blackberries. Some sloes and other plums, and hawthorns, have set fruit well, but the crab and wilding apples are a bit hit and miss. My walk is a short one which is good at anytime of year, especially spring and autumn. It is through the Old Orchard near Barnt Green. If you’re starting from Alvechurch there are plenty of nice ways to walk to Barnt Green, but I think the best is up from Withybed Green. You walk up the field path to Foxhill Lane, go right until you meet Coopers Hill, cross that, and follow the field paths (crossing the motorway footbridge) meeting the Blackwell road in Barnt Green. This path is beautiful in spring and summer, with bluebells giving way to buttercups, and passing small woods with some lovely trees. If you start from Barnt Green, head up Blackwell Road and walk on the right. Even this stretch is interesting, with a cherry-plum tree dropping yellow fruit on to the pavement. As you leave the village, the pavement is replaced by a footpath which rises above the road and follows a little ridge between the road and the railway. This stretch is absolutely lovely in late spring, being a mixed wood, including old oaks, birch, pine, rowan and a young sweet chestnut. In May it is shimmering with bluebells. It’s nice at other times though, with broom in summer, and even in winter the birch trees look good and there is often gorse in flower. It is rather near the motorway so is unfortunately never quiet, but is one of those little gems of old woodland. At the end of this stretch is a little road to the right crossing the railway, and then a footpath passing to the right of a house to take you into the Old Orchard. This path has lovely birch trees along it and holly bushes. Just inside the orchard are foxgloves in June. For a short walk, when the path forks you can go either on the right or left branch to the end of the orchard, across the back of it and then take the other branch back. The orchard is not much looked after now, but still has its fruit trees, and a mixture of woodland and meadow flowers. It’s a perfect picnic spot. On the left just after you come in is a stunning, large pear tree, which has dazzling white blossom in spring. It has some fruit this year, high up. Along the left-hand path and in the centre are several old apple trees, which blossom beautifully and usually have good fruit in autumn, but rather thinly this year. Below them is a carpet of bluebells in May. In summer you will find masses of pretty yellow tormentil, pignut, sorrel, birds foot trefoil, and later delicate blue harebells. Wild roses hang in the hedges. The right hand path is more open, and has meadow flowers. Here it is good in late summer, with knapweed and betony. Betony is a typical meadow flower which is not common round here. There are usually lots of butterflies, including small blues, and bees on both the fruit trees and the later meadow flowers. If you want a longer walk, continue on the left hand fork of the path to the edge of the Orchard, where a gate leads you into fields. The path takes you over the fields until you join a track which takes you alongside the motorway and then curves right to meet Linthurst Road. Turn right and walk along the road for about ten minutes until you see another footpath sign right to the Old Orchard. Follow this along a good path through another patch of old woodland. This includes another old orchard, some lovely beech and bluebells and a spectacular crab-apple. It then crosses a field back to rejoin the orchard where the right-hand fork path meets the edge. Of course you can do the walk the other way round too. The fields are interesting. The first one has big horse chestnuts in it. At one time the second field, near the motorway, had wonderful arable weeds: hemp-nettle, heartsease, chamomile, and pimpernel. However, recently it has been mown and grazed with sheep and is just grass. The track near the motorway looks like an old lane, and has lovely scrub plants. Among it are beautiful teasels, purple at the end of summer and architectural through the winter, lots of comfrey (an ancient herb) and an unfortunate patch of Japanese knotweed. The field on the other side from the right corner of the Orchard is horse pasture. It has good flowers, having a rather sandy soil. There are large patches of knapweed, the less common sneezewort, and the pink centaury which is quite rare round here. I usually see the latter two near the sea. I think this walk is a good way of seeing a lot of local habitats in a small space. I have usually seen good birdlife while walking here, including jays and green woodpeckers. Most of it is through areas which obviously used to be used and managed but are now fairly neglected, though the patch of wood near Linthurst Road looks as if someone is managing it now. You can often walk right round without meeting anyone else. The road sections have some of the more upmarket huge houses and gardens of Barnt Green, and there is noise from motorway and railway, but this somehow emphasises the solitariness and wildness of the orchard, woods, fields and paths. The walk is easy and level, with mostly gates and only one stile, though muddy in parts after rain. The whole walk from Barnt Green only takes about an hour and a quarter. Go next May, but don’t wait till then. All along the way are superb blackberries, and in some places there are blackthorn bushes with sloes. Go in the next few weeks, and take a plastic bag! I pick fruit and make jam. Later at home I saw the towers fall again and again. That doesn’t come in the teaching manuals. Handing in our warlike tweezers. All wearing flags to ward off the truth. A building falling into his classroom. Selling courses in emergency procedures. But what to learn is not in the manuals.